Three and four-year-old children may attend all-day preschool for two, three or five days a week. Concepts are introduced during Circle Time. Readiness skills are introduced and practiced during Teacher Table. Social skills and language skills are reinforced during stations where students work as partners to complete a given task, to play a game or to review a newly acquired skill. Weekly small group activities introduce the basic concepts of math and science. The staff reinforces the development of good manners, table etiquette, problem solving skills and appropriate hygiene practices, in addition to providing a strong foundation for academics. Learning Centers allow children to explore their senses, to use their creativity, to design projects or play scenarios, to construct or to build using a variety of materials and to communicate with one another during this learning process. Students are responsible for returning learning materials to their appropriate places at the end of each play session. Pre-K Programs: Navigators and Challengers Full-Day Preschool Children who are four-years-old by September 30th are eligible to attend pre-kindergarten classes. Students may attend this full day program for two, three or five days a week. These classes offer a strong academic curriculum which is aligned with the Ohio Department of Education Early Learning Content Standards. All children participate in large group learning activities for Circle Time. Children also receive small group instruction tailored to meet their educational needs and learning style at the Teacher Table. Children complete extension activities or review newly acquired skills at the Independent Table. Lead Teachers evaluate skills in concept development, language skills, math readiness skills, self-help skills, gross motor skills and fine motor skills. They document learner progress using checklists and portfolios. For those children who will turn five-years-old by the following September, a formal kindergarten recommendation letter is sent home to parents at the end of February. Parent involvement is encouraged. Parents help the children choose a Show and Tell item to match the Letter of the Week. During the year, each child participates in Student of the Week. Parents help their child with special activities, pictures, stories and favorite foods to share during their week. Children participate in field trips off-site or attend assemblies with guest performers on-site during each month of the academic session. During summer camp, students attend weekly field trips. Students learn skits and songs to perform on stage at the annual Blue Ribbon Day at Stubbs Park. The Challengers' classroom is comprised of up to 14 children. 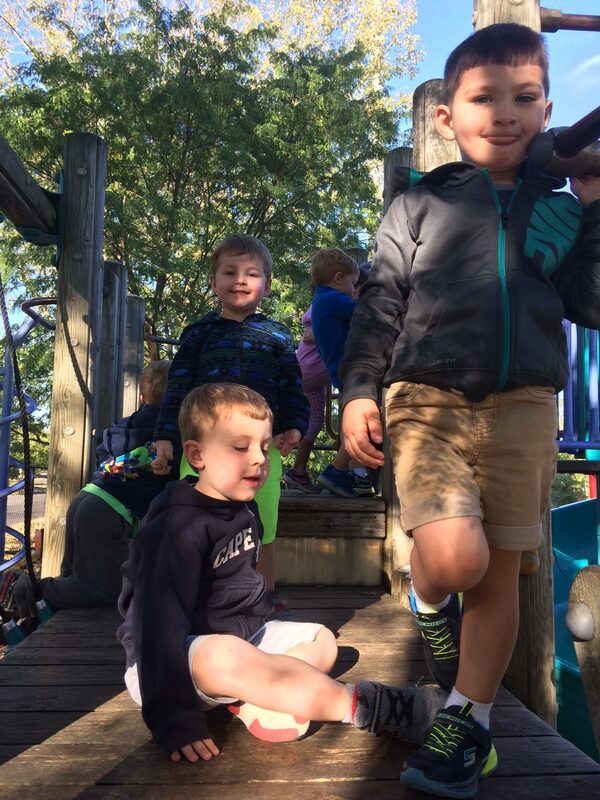 The Challengers' yearlong themed curriculum has been developed by Cathy Valentour, owner and Executive Director, in collaboration with Centerville Schools to optimally prepare the children for a successful Kindergarten experience. Weekly curriculum-based lessons focus on developing independence as well as academic preparedness in reading, writing and math skills in an environment that is both challenging and fun. In addition to group goals, the teacher collaborates with parents and administrators to develop individual goals that are communicated to parents through daily notes, lesson plans and semi-annual conferences. In the Challengers' classroom, children's individual ideas and unique interests are embraced and developed. Each week is filled with new projects and investigations that allow children to work together in a democratic setting to try out new ideas and learn more about the world around us. Children who graduate from the Challengers' program have been given the tools necessary to work with others and achieve academic success in Kindergarten and later in life.